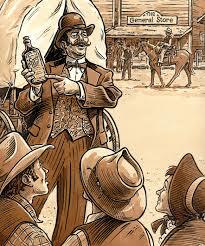 You may be familiar with the term snake oil salesman. This term refers to someone who tries to sell a fraudulent health product that is unproven. They say history repeats itself, well here we are, believing the snake oil salesmen again. Actually, almost everything you’ve heard for the past 20 or 30 years about diet and exercise IS true. Fresh vegetables and fruits are good for you. Don’t eat too much cake or candy. Choose leaner cuts of meat. Use butter in moderation. Add some real fiber to your diet (nuts, beans, whole grain). Eat more home-cooked meals. Grow a vegetable garden. But guess what? Some people just plain don’t want to do it! Others are just overwhelmed with other priorities, or confused about the nutrition information they hear. From my perspective, and that of many of my dietitian colleagues, the misconception that the dietary advice (meaning the therapeutic use of food as medicine) that RDs have been preaching for decades is “dead wrong”, is just that – a misconception and misperception. For those of us who have been working in the field of food and nutrition for decades – there is no mystery here. But the media, and a few self-proclaimed experts (i.e. no formal education in the science of nutrition) continue to make it more and more confusing. Another example is the book Sugar Savvy, recently reviewed by an RDN. Written by Kathy Dulgin (aka High Voltage). While I support Kathy’s efforts (and Dr. Oz’s) to engage people in pursuing a healthier lifestyle, I can’t support engaging them with false statement about food, sugar, and nutrition science in general. Tell people to cut back on sugar. Give them ideas about how they can do it. But don’t tell them sugar is “killing us” and that people have no responsibility or control over what they choose to eat. I guess everyone just wants to wish their troubles away. Twenty years ago, most doctors were not paying any attention at all to how therapeutic diets or a referral to a registered dietitian or certified diabetes educator could help their patients. Now everyone is suddenly interested. Shall we call this another aspect of the “Oz effect” ? So in other words, Oz doesn’t care if there is any science to support the claims he makes on stage, he just “believes” in it and feels good recommending it to his audience (which he seems to think is only the people actually in the studio, not the millions watching). This is not what medicine is supposed to be like. The Practice of Medicine (and registered dietitians practice under the umbrella) is supposed to be evidence-based. Peer-reviewed. Shown to do no harm. Between Dr. Oz and so many unscience-based diet books on the market, I have to ask: How did we get here? It’s time for America to show the snake oil salesmen what you’re made of. Make better choices at the grocery store, cook at home more often, buy less packaged food. Sorry, I won’t lie – it’s not going to be easy, it never has been. Losing weight is hard (which is why it is worth working on preventing weight gain in the first place). It’s not easy to eat right and exercise. But your health and happiness is worth it. This entry was posted in Food Facts, Misc and tagged diet, dietitian, dr oz, nutrition, quack, RDN, science, sugar by Rosanne Rust. Bookmark the permalink. hear, hear! Well said Rosanne!